In 43 AD, Scribonious Largus, a court physician to the Roman emperor Claudius, recorded in his book ‘Compositiones Medicamentorum’, a most detailed collection of drug compounds or recipes in use by physicians at that time. Among these he mentions the use of electrical currents to treat headaches and gout by applying electric torpedo fish to the affected regions or by placing painful extremities into a pool of water containing torpedo fish. In the late 18th century, Luigi Galvani provided the first scientific evidence that electrical current can activate muscles. During the 19th and 20th centuries, researchers studied and documented the exact electrical properties that generate muscle movement. It was discovered that the body functions induced by electrical stimulation caused long-term changes in the muscles. The principle of electrical muscle and nerve stimulation is to stimulate the peripheral nerve fibres of muscles through brief electrical impulses transmitted by electrodes placed on the skin. 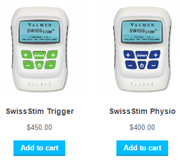 These impulses, typically generated by electronic muscle stimulator devices, target both the motor nerve and effect a mechanical muscle response (EMS) and the sensitive nerve fibres, creating analgesic and endorphin effects (TENS). 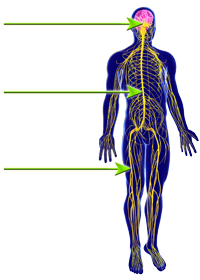 The stimulation of the peripheral nerve fibres will generate the release of neurotransmitters which will lead to a contraction of the muscle. Some of the neurotransmitters released have analgesic properties (Pain treatment) and some other will trigger vascularisation. (Growth new blood vessels). In order to contract or shorten, muscle fibers must be stimulated by nerve impulses sent through motor neurons or nerves. from there, they branch out to all parts of the body. 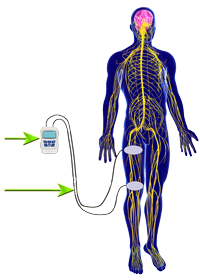 Electrical neuromuscular stimulators devices act in a similar fashion by sending electrical impulses to the nerves and muscles. then reach the nerves and muscles through the lead wires and the electrodes. EMS should be used for muscle conditioning purposes as a supplement to physical activity, sport and exercise and not as a direct replacement. 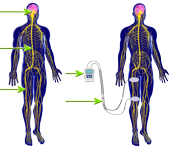 Understand how electrical neuromuscular stimulation works.